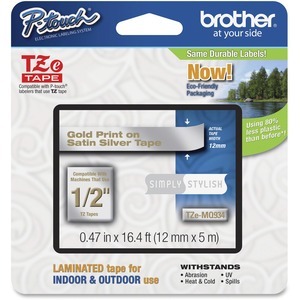 Tape features Brother's exclusive laminated tape process and standard adhesive. Perfect for everyday applications, these labels stay on under normal indoor and outdoor use, including hot and cold environments. It best suited for smooth flat surfaces. Tape is designed for Brother GL-100, PT-1000, PT-1000BM, PT-1010B, PT-1010R, PT-1010S, PT-1090, PT-1090BK, PT-110, PT-1100, PT1100SB, PT-1100SBVP, PT-1100ST, PT-1120, PT-1130, PT-1160, PT-1170, PT-1180, PT-1190, PT-1200, PT-1230PC, PT-1280, PT-1280SR, PT-1280VP, PT-128AF, PT-1290, PT-1290BT and PT-1290BT2. Print color is gold. Background is satin silver. Tape measures 12mm (0.47") wide x 5m (16-2/5') long.